Collider: Acting was my first love. It was the first and only thing that I was excited to wake up at six in the morning on a Saturday to go do. I spent a lot of years working on a lot of projects that weren’t necessarily fulfilling. There were things that I worked on because I’m a professional and it’s what professional actors do. I worked on a lot of projects that I didn’t necessarily watch, or wasn’t necessarily a fan of. I’m just very lucky and I’m enjoying every second of this because I do realize that it’s fleeting and that you can’t always work on something like this. I’m not always going to be able to work on the hottest show on TV, in the coolest part I could ever play, in 2010, which seems like the year or the werewolf. It’s not always going to be this good, so I’ve got to enjoy every single moment of it. It is these moments that remind me of why I set out to do this, why I worked so hard and why I persevered, stuck around and stuck it out. This is a big reward for me, for sticking around (Joe Manganiello Exclusive Interview TRUE BLOOD). 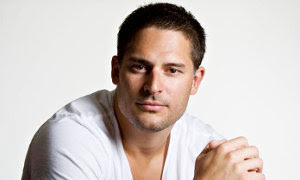 Joseph Michael "Joe" Manganiello (born December 28, 1976) is an American actor. He played Flash Thompson in the Spider-Man film series, and had recurring roles in television on How I Met Your Mother and One Tree Hill. He plays werewolf Alcide Herveaux on the HBO television series True Blood. As of 2010, Manganiello lives in Los Angeles, California. He is a supporter of Until There’s a Cure, a charity dedicated to fighting HIV/AIDS, and appears in public service announcements for the organization. In 2010 Manganiello was named one of People Magazine's sexiest men alive. In 2011 Manganiello was named one of Men's Fitness Magazine's 25 Fittest Guys and one of US Magazine's Hot Hollywood Style Stars. (Wikipedia).